Morning buses will come every 10 minutes for Lines 1 and 2 starting November 30. 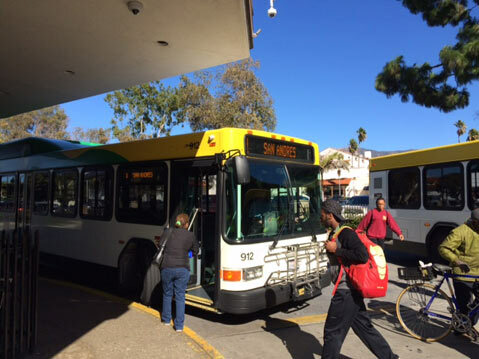 Two bus lines that run through Santa Barbara’s Westside and Eastside are increasing their service starting Monday, November 30. Line 1, which runs by La Cumbre Junior High via Modoc, Portesuello, and Gillespie to the Transit Center — via Mission, San Andres and Carrillo streets — will run every 10 minutes during the morning rush from 6:30-8:30 a.m. Line 2, which runs across the Eastside from the Transit Center to Santa Barbara High School and then down around Milpas, Montecito, Salinas, Punta Gorda, Voluntario, and Carpinteria streets, will also stop by more frequently from 6:30-8:30 a.m., every 10 minutes instead of the current 15.